Part of the reason I love living in Colorado is that we can get outside almost every day of the year. Sure, it snows here, but it’s a pretty snow — usually around just long enough to be fluffy and sparkling but melting before it gets packed down and dirty. It can be 28 degrees and snowing in the morning, and 45 degrees and melting by mid-afternoon. But we do get about a week every winter where the temps stay in the single digits and no one goes outside if they can help it. When I lived in Southern California, we had the opposite problem. We’d have extreme heat days instead — when temps topped 100…and sometimes 110 degrees…and we’d spend the day mostly indoors. So here’s a collection of indoor activities for kids. They’re not too complicated, and they use items you already have in the house (since…you know…you’re stuck in there). You can pull out storebought or make homemade playdough — either one is a great way to pass the time. Or winter cards. Or any cards to brighten someone’s day. 3.) Write letters to grandparents. 4.) Make a pillow and blanket fort. (I mean, inside the fort). 6.) 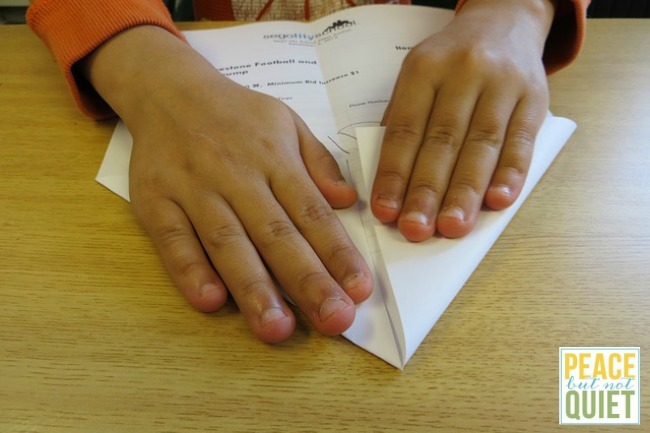 Play paper airplane golf. Paper airplane golf is like Frisbee golf — make paper airplanes, then set up an obstacle course with targets to hit with your airplanes. 7.) Play hide & seek. 8.) Play Object Hide & Seek. This is great for smaller spaces or older kids — hide a small object and make kids find it. 9.) 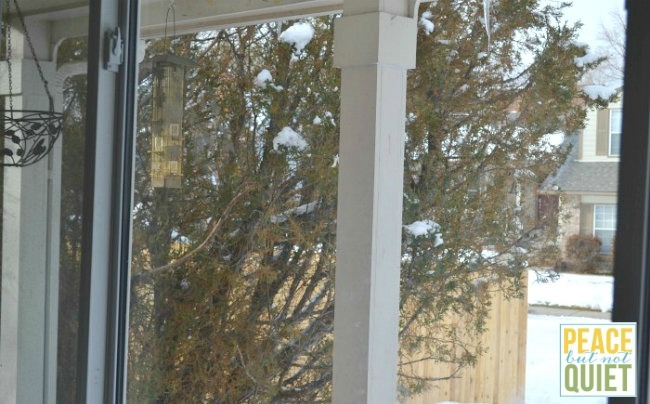 Birdwatch from a window. 10.) Have a scavenger hunt. If you have older kids, you can put them in charge of coming up with clues or objects for the scavenger hunt. Or you can create it yourself and let the kids find the objects. 11.) Write and illustrate a story on your phone or tablet. Use the Scribble My Story app and have the kids make up their own story. They can illustrate it right there on the app as well. 12.) Make an indoor fairy garden. Using only objects you find around the house, make a warm comfy indoor fairy garden. The fairies don’t like it out in the cold, either. 15.) Have some bathtub fun. 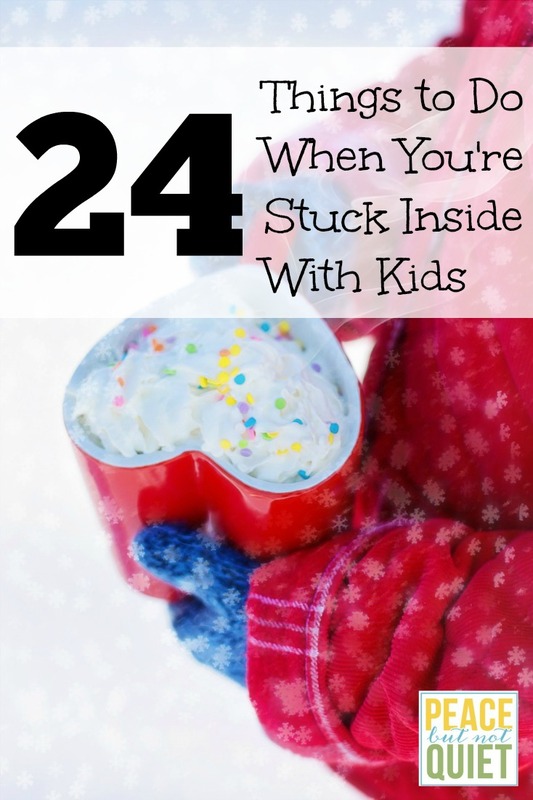 Bring slotted spoons, measuring cups, basters, etc in for kids to play with during bathtime. 17.) Have a fire and roast marshmallows. 18.) Make a LEGO city. 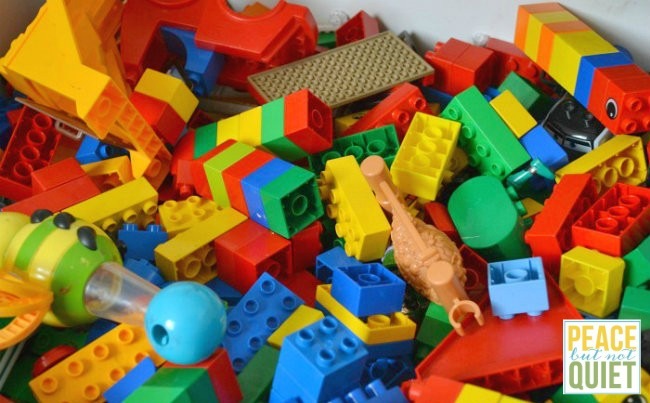 Take out all the LEGOs, Little People, trains, and other play sets and make a massive indoor city. 19.) Have a dance party. Blast the music and have a dance party. Or a karaoke party, using kitchen utensils. Collect 5 random objects from around the house. Invent something with them. 22.) Bang on pots and pans. 24.) Learn a new skill, like crocheting or fingerknitting. Look up videos on youtube if you get stuck. But you know what? If you’d rather stay in your jammies and watch videos on the couch all day, sometimes that’s okay, too. What do you do when you’re stuck indoors all day? Thank you for visiting Peace but Not Quiet! Be sure to sign up for the newsletter and get a free printable — “25 Ways to Play Outdoors With Your Kids”. you can make a wreath for the birds to use for nesting in the springtime using a wire hanger made into a round shape or a grapevine wreath, scraps of yarn , and feathers to be wound around and threaded through.